The Ford Expedition is all-new for 2018. We got a lighter, brawnier Expedition with better fuel economy and plenty of features Expedition owners have come to expect--three rows of spacious seats, a cavernous cabin with plenty of cargo space, excellent towing and payload capacity, proven reliability, and more. Below we'll detail what goes into making one of the best full-size SUVs in America. After giving the F-series trucks the aluminum treatment, Ford went ahead and did the same for the Expedition in 2018. But it's not any ordinary aluminum and not every metal piece was affected. The metal in question is an industrial-grade aluminum alloy. Think: less like foil wrap, more like steel. A lot of the incidental metal pieces received the aluminum treatment, like the hood and roof. The parts that take the greatest strain have kept their original steel composition. Why aluminum? Well, it made the Expedition and its F-series siblings a lot lighter. 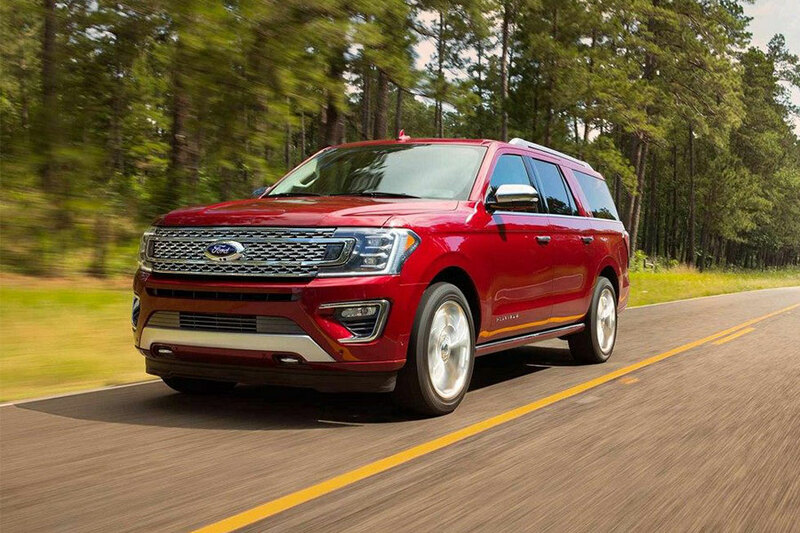 Despite being inches longer and wider, the 2018 Ford Expedition is hundreds of pounds lighter than the 2017 model. That's good news for fuel economy-now 17 miles per gallon in the city and 24 on the highway-while also making the Expedition feel less massive while driving. The steering and suspension feel more precise than you'd probably expect in a vehicle this size. Still, use the 360-degree camera in parking lots. It's still a massive SUV. There's only one engine available in the Expedition, but it's a humdinger. Meet the 3.5-liter EcoBoost twin-turbo V6. This engine delivers 375 horsepower and 470 foot-pounds of torque. This engine is tweaked slightly for Platinum models to do even better: 400 hp and 480 lb-ft of torque. It's equally yoked to a 10-speed automatic transmission. There's 4-wheel drive available or 2-wheel drive with Terrain Select system to meet the road prepared. All this power is put to good use. The 2018 Ford Expedition can pull up to 6,000 pounds, when properly equipped. The Expedition can haul 1,750 pounds with its payload capacity as well. So load this Ford with eight passengers, fill its 20 cubic feet of cargo space, and watch the Expedition bear the load with ease. We don't want to say that the 2018 Ford Expedition is one of the most reliable vehicles in production today…. Wait, actually, we do want to say that. Because it's absolutely true. J.D. Power and Associates gives the Expedition a perfect score: 5 out of 5 for reliability. Pair that rating with the Expedition's three-year/36,000-mile bumper-to-bumper warranty and a five-year/60,000-mile powertrain warranty, and you have a winning combination. You can expect the Expedition to go farther with fewer problems over the course of its undoubtedly long life. The 2018 Ford Expedition is the first of its generation. Keep an eye on this one because we expect the Expedition's sales to continue to increase. Ford put the Expedition back in the game in a big way, and this large SUV is already leading the pack.